St Petersburg Economy Russia | An Overview! The St Petersburg economy has grown quickly since the end of Soviet times. Now it's focusing on stability! Awarded first place for minimal investment risk in 2006, and more recently, for high effectiveness of regional administration, St. Petersburg, and indeed Moscow and the whole of Russia today is economically and politically stable. This is regardless of the ongoing tough sanctions imposed by the West, which in my humble opinion are an open and direct economic war on Russia. As an important trade gateway and an industrial and financial center of Russia, St. Petersburg is also now the best tourist center of north-western Europe. The city, also known as North Palmira or Northern Venice due to its special romanticism and the great number of rivers and canals embellished with historical buildings, is becoming one of the top destinations for investors in Russia and one of the best Russian holiday destinations for travellers from all over the world. We can say that the Russian economy of the North-West Federal District is considered the fifth largest in the country. Industrial production and tourism play a key role in the economy of St Petersburg. Undoubtedly, the city is one of the most important tourist and cultural centers in the whole Russian Federation. It is interesting to note that the leading industries, employing over 20% of the city’s eligible workforce, are mechanical engineering, metallurgy and the food industry (headed by the production of beverages). The main leading investor countries are France, USA, Belarus, South Korea, Brazil, China and Belgium. The largest contributions to St Petersburg’s GRP (Gross Regional Product) growth come from construction, retail, science, telecommunications and the services sector, including education, healthcare, utilities, insurance and real estate brokering. However, for many years the city’s manufacturing industries have remained far greater tax contributors than the other sectors of Russian economy, providing about 25% of tax revenues to the imperial city annually, with foreign investment of 90%. 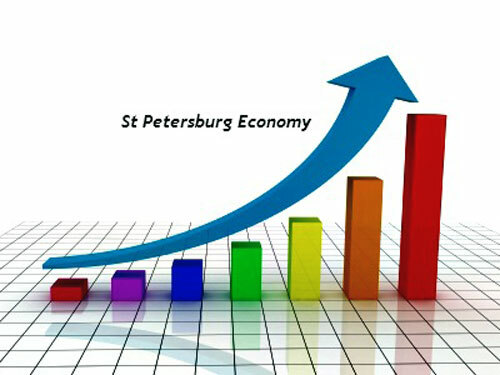 During 2011, St Petersburg's economy was showing stable and diversified development with growth rates varying in different economic sectors. In fact, the residential stock increased by 2.70 billion square meters, or 44 737 apartments. Stabilization of the financial sector contributed to the acceleration of residential construction and the annual growth reached up to 1.9%, much better than the previous year. As a result of that, in 2011, included 2012 and 2013 the GRP exceeded pre-crisis level and reached 13.7%. Furthermore, based on the Committee for Economic Development, Industrial and Trade Policy, in 2011, 2012 and 2013, the Industrial Production Index reached 113.8%. The highest growth was registered in the shipping volumes of the manufacturing industry (130.9%), company revenues (121.2%) and wholesale volumes (110.8%). The only reduction registered was for fixed investments, which amount to 215.6 billion rubles in 2011, that is 85.4% of the 2010 volumes. At the same time, in 2011, foreign investment in Saint Petersburg reached $3.97 billion, which is 106.7% compared to 2010. As a result of this high growth, there was also an increase in nominal wages and several investments to improve the city's infrastructures. Combined with a decline in officially registered unemployment, this indicates that labour markets are stabilizing. Speaking of Russia in general, according to the Federal State Statistics Agency (Rosstat), in the second quarter of 2013 the Russian economy grew by a healthy 4%, but it was down from a GDP growth of 4.9% registered in the first quarter of 2013. Instead, from 2014 up to today, things have turned out not very well because of the sanctions, tough a growing internal market like food is stabilizing itself and bringing new opportunities to the locals. That said, for the year 2017 we don't have any figures about the St Petersburg economy yet. However, we can tell you that the car production sector in the city of St Petersburg is still the second biggest in Russia (after the Privolzhsky region) with major international companies such as Toyota, General Motors, Hyundai and Nissan located in the suburbs of the city. New major infrastructure projects are under way to improve the city of bridges in many ways, such as building an international transport juncture and logistics hub. And we have also heard that there are plans to invest more in the tourism sector, build new properties and make local products more competitive abroad and, who knows, maybe even more. For these reasons, the city of Peter the Great has become a leader in terms of economic growth in the country and hopefully this will continue for years to come despite new difficulties and global challenges may arise. Anyhow, in case you are planning a travel to St Petersburg for business, or you just would like to know more about the St Petersburg economy, we think that the St. Petersburg International Economic Forum, held each year at the end of June, is the right place to visit for getting the latest update on global and Russian economic news.